As sugar becomes cheaper, more available, and more prevalent in our society, it is important to understand what it does to our bodies. Sugar is found naturally in our foods but in recent decades refined sugar has been increasingly added to our plates. Our body has functions to deal with the excess sugar. As blood sugar levels rise, a digestive organ called the pancreas secretes insulin, a hormone that stimulates cells to absorb sugar for energy use or for storage. This leads to a drop in blood sugar levels. If blood sugar is too low, the pancreas can also produce another hormone, glucagon, signalling the liver to release stored sugars. This increases the level of sugar in the blood stream. By secreting these hormones at appropriate times, the body is able to maintain a steady balance of sugar in our blood that is needed in our vital organs and muscles. However, the pancreas cannot keep up with the high rate of sugar consumption today. The abundancy of sugar and high caloric diets in modern society, leads to obesity, high blood pressure and heart disease. This increases your chance of developing diabetes, The Havard School of public health found that if you drink 1 to 2 sugary drinks every day you are 26% more likely to develop type-2 diabetes compared to those who only drink 1 every month. 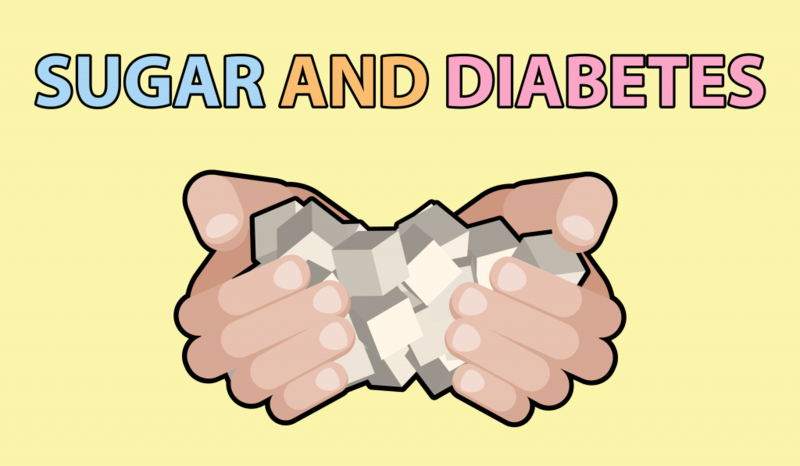 While it’s not certain how type-2 diabetes develops, sugar definitely plays a role. One study found a correlation between the availability of sugar and the increase in the rate of diabetes. Its findings showed that for every 150 calories of sugar available per person per day, diabetes levels rose 1%. So, it’s important for both diabetics and non-diabetics to control how much sugar is in their diets. The American Heart Association recommends limiting added sugars to only 36 grams of sugar for men. That’s around the amount of sugar in a standard size can of coke or 3 small bananas. And 25 grams for women, the equivalent of a can of redbull or a cup of unsweetened apple juice. We should note here though that actually it is not necessary to add any sugar to foods – this is down to the choices you make. After only 2 to 3 weeks of not adding sugar to any foods, and only eating natural sugars, you can alter your habits and taste buds. Carbohydrates are still an important part of our diet, it’s one of the three macronutrients our body needs, including fats and proteins. But you should avoid simple carbs, like those found in refined table sugar, which have simple chemical structures and can be digested quickly and spike your blood sugar levels. This can have negative health effects in the long run, especially to your pancreas, insulin producing cells and your body’s insulin sensitivity. Instead, people should eat complex carbohydrates. These have more complex chemical structures that take longer to digest and have a less dramatic impact on the blood sugar level. Additionally, most complex carbohydrates contain fibre, vitamins and minerals, benefiting your health even further. You can also figure out which carbs are beneficial to the body by looking at its glycemic index. The glycemic index is a ranking of foods based on how quickly and by how much they increase blood sugar levels after consumption. Knowing the characteristics of foods with a low glycemic index can help you determine what to eat. Unprocessed foods such as whole grains are lower on the glycemic index compared to processed and refined foods. The physical form can also affect the glycemic index, for example it is healther to eat brown rice compared to white rice. High fibre foods have less digestible carbohydrates, slowing down the absorption of sugar and causing a slower rise in blood sugar levels. Also, Ripe fruits and vegetables will tend to have a higher glycemic index than un-ripe foods. Finally, the American Diabetes Association has a few tips for keeping a healthy diet. If you are reducing caloric intake to lose weight, try to focus on protein and healthy fats. This will keep you full for longer and reduce your cravings for unhealthy foods. You could also consider eating more non-starchy vegetables – which are those greens with lots of micronutrients, water and very little calories. Avoid eating sugary snacks, processed foods and alcohol. You should also be aware of much of the hidden sugar in foods. Lastly, since larger meals may cause blood sugar levels to spike and leave you hungry between meals, try eating smaller meals more frequently. This can spread out your sugar intake and prevent unhealthy snacking. In summary, if you are aware of what foods contain added sugar, you are then in a position to make a choice. Eat a healthy variety of foods, and aim for more whole foods rather than processed foods. It can be a tricky balance sometimes, but it is totally possible to make a change. If you liked this video, then please share with your friends, subscribe to our YouTube Channel, and of course like us on Facebook too.